From humble beginnings, Bhutanese football in the Himalayas now aims for a lofty future. First featured on the award-winning website on football & pop culture –Goalden Times. The story of football in Bhutan is as unique as the little known Himalayan Kingdom itself. The high mountains of the world’s largest range line most of Bhutan’s border, ensuring isolation from the rest of the world that is as managed and maintained as it is a natural consequence of such majestic beauty. While the onset of satellite television and the internet breaks down barriers to the outside world, Bhutan’s expensive visitor tariff of $200-250 a day restricts the numbers of tourists each year to less than the number of passengers passing through London’s Heathrow Airport in a single day; a side effect of which ensures that the industry remains ecologically sustainable, and Bhutan, for the most part, remains unchanged unsullied, and pristine. Due to their isolation, football in Bhutan was a relatively late starter. Nobody knows for sure how the sport arrived high up in the Himalayas, but it is believed that traders and teachers brought the first balls, and from there the game took hold. Even so, it wasn’t until the 1980s that a first ever Bhutan National Football Team emerged from the mountains. A first foray into international football in April 1982 at the All Nepal Football Association Cup in Kathmandu saw Bhutan lose 3-1 to the Kunming Army Team from China, before the losing by the same scoreline against the host nation. Two years later they lost to Bangladesh, Nepal, and The Maldives in the South Asian Games, also held in Kathmandu. These two competitions would remain Bhutan’s only football outlet during the 1980s, playing further tournaments in Dhaka, Bangladesh and Calcutta, India, as well as a third visit to Kathmandu. Thirteen matches played in five years, all away from home; no victories, and only two draws against the Hong Kong Gurkhas, and the Nepal Youth Team in 1986, and then, just as quickly as it appeared, the Bhutan national team disappeared from the international stage, for twelve long years. Bhutan is plugged with adversities. It is not a wealthy country, adding to the woes the geographical isolation means that travelling by coach to India or Nepal could take days, if not weeks. Communication systems and commuting to other nations, both are fragile. There is only one airport servicing the outside world, where only a handful of pilots are qualified to land due to the perilous descent between mountain face and sheer valleys. Due to the aforementioned reasons, participating in international football was often a luxury that the country simply couldn’t afford, and playing for the Bhutan National Team has always been a labour of love, demanding time, money, and a dedication to attempt to overcome the better facilities, training, and opportunity of their opponents. However, the road to resurrection was not smooth at all. 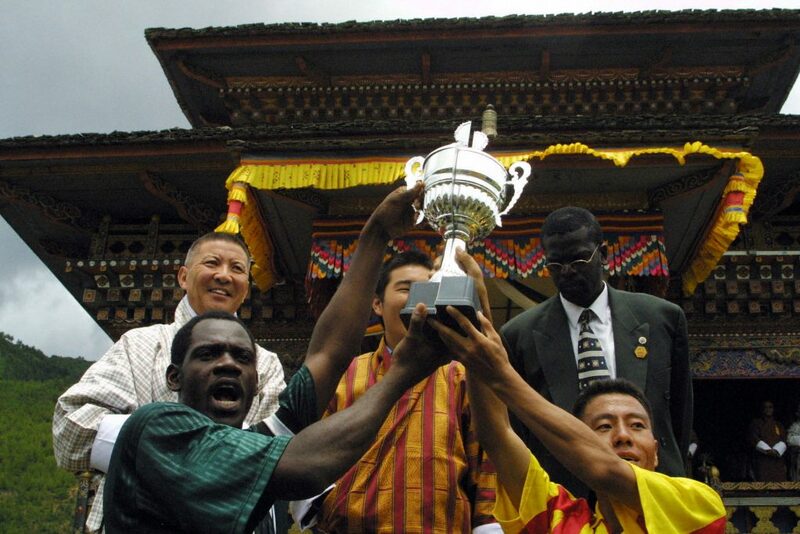 When Bhutan returned to the international stage in 1999, a 7-0 defeat to Nepal awaited them. The following year, and a first foray into the Asian Football Confederation Cup qualifying rounds, the Bhutan National team would make global headlines. Playing four games in seven days in Kuwait City, Bhutan would lose 3-0 to Nepal, 8-0 to Turkmenistan, 11-2 to Yemen, along with a then world record defeat 20-0 to the host nation. To any other nation, such a defeat would have been a disaster. But Bhutan isn’t any other run of the mill nation, as witnessed in the 2002 documentary ‘The Other Final’, a film about a match played between the two lowest ranked football teams in the world: Bhutan, and Montserrat from the Caribbean. It would be the very first FIFA-sanctioned match to be played in Bhutan; after more than 30 years there would, at last, be a home match for the Bhutanese. More important than the result (a 4-0 victory for Bhutan, their first in 30 years) was the insight this film offered on a culture unique in the world. The peaceful, magnanimous demeanour of these Himalayan Buddhists, whose very being transcended the material world where no victory in 30 years could constitute the end of it, elevated them, and football to a level where self-expression, joy, participation, and representing your friends, your family, your nation, at football, was far more important than any scoreline that would follow. 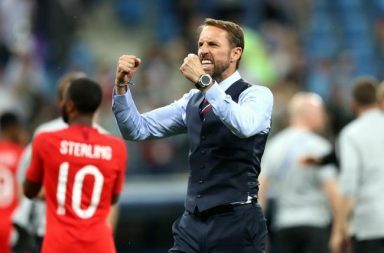 Their approach to the game was unique, shrouded with some “happiness philosophy“ which other nations were reluctant to embrace. Losing 20-0 against Kuwait most definitely hurt the players, but rather than crushing a fledgeling football nation, it inspired the team and its supporters to keep trying, to take strides regardless of the outcome. Because the nation, its players, and supporters don’t necessarily view victory and defeat in the way the rest of the world does. Thanks largely to Buddhism and a government-sanctioned policy of ‘Gross National Happiness’, that determines that the spiritual, physical, social and environmental health of the population, along with the wellbeing of the natural environment, than the Gross Domestic Product – the economic tool used by the rest of the world, Bhutan looks at life with a unique perspective. 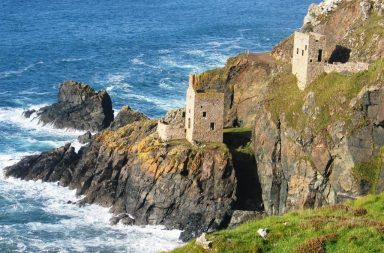 If wellbeing takes preference over material wealth and prosperity is measured in the health of the natural environment (it is government policy for Bhutan to remain carbon neutral and for a minimum of 60% of the countries landmass to forever remain under cover of forest) then it is no wonder that, combined with the benign philosophy of Buddhism, the countries’ football players and supporters view victory and defeat with a slightly different perspective. Bhutan’s wait for a second victory on the international stage wouldn’t last as long as it did with the first. Ten months after their friendly victory over Montserrat, the Dragon Boys beat Guam in an Asian Cup pre-qualifying tournament that also saw them draw with Mongolia to win their group. A trip to Jeddah, Saudi Arabia, was their prize, where they lost in the second qualifying round to the hosts, 6-0 and 4-0, as well as defeats to Yemen 8-0 and 4-0, and two close fought 2-0 defeats to Indonesia. After this relative high-water mark in Bhutanese football, the national team fell back into the routine of sporadic flurries of matches in regional tournaments such as the South Asian Cup and The Asian Football Confederation Challenge Cup. The occasional friendly with neighbours Nepal the only other international footballing outlet. Something was missing. The pinnacle of every international footballer’s dream: the ultimate magnum opus; the World Cup. Unlike the South Asian Games, or the AFC qualifying tournaments, where teams would play a minimum of three or four matches within a week, and the groups would be drawn (as best as possible on the vast continent of Asia) based on geographical proximity, the World Cup qualifiers in Asia, in the early rounds at least, are based on a simple home and away tie – that could potentially result in vast distances being travelled. For the under-resourced Bhutan Football Federation, the cost of participating in the qualifying rounds of the World’s premier competition was an exorbitant dream. However, after more than 30 years in the World Cup football wilderness, struggling to maintain football in the country based on enthusiasm and passion alone, FIFA’s Goal programme began to help. But above all that, funding for the Bhutanese enabled them to finally compete for the competition they had dreamt about since those early matches in 1982: The World Cup. In March 2015, in the Sugathadasa Stadium, Colombo, Sri Lanka, in front of 3,500 spectators, Tshering Dorji scored Bhutan’s first ever World Cup qualifying goal which helped them to win their first ever World Cup qualifying game. “In early 2015 we got word that FIFA would be helping with a grant of US $300,000 to facilitate our participation for the World Cup Qualifiers. With a meagre source of funding and absolutely no sponsorship of any sort, participating in an international tournament was a distant dream for the Bhutanese national team until this news of FIFAs grant. We decided to give it a try, after all we thought we would probably not win. I had volunteered to be the manager of the national team because I was convinced that if given proper support, our boys had the talent to at least be competitive. The pressure of our teams in the past, be it the senior national squad or the age group squads or for that matter clubs, when we travelled outside was always to avoid an embarrassment. If we lost by a margin of less than six goals, we considered that a major achievement. The score-line in our minds were always in dozens. Bhutan was drawn to play against Sri Lanka, a team that we had never beaten. The team was selected in early January 2015 consisting of mainly boys who graduated from the football academy run by the Bhutan Football Federation, the boys trained in Thimphu for about a month and then we had two weeks of training in Bangkok, which was generously supported by the Thai FA. In Thailand we trained in the mid-day heat with temperatures over 35OC to help us get used to the expected heat and humidity in Colombo. It was hard work’. ‘Prior to our departure I talked to the team who were seating on the grass outside the office of the Bhutan Football Federation. I told them that I strongly believe that we can beat Sri Lanka. I remember the exact words I said to them – “Win against Sri Lanka and not only football in Bhutan will change but your life will also change – lose and nothing will change”. When our team arrived in Colombo we read some very demeaning stuff about Bhutanese football. One of their former captains had said something along the lines – “playing against Bhutan is a pure waste of time, we will not even acquire experience”. On the day of our match there was a school cricket match in a stadium nearby which was completely sold out with about 30,000 people attending that game whereas for our match we had about 200 Bhutanese students who had come to support. There were only a handful of Sri Lankans and it felt more like a home game for us. 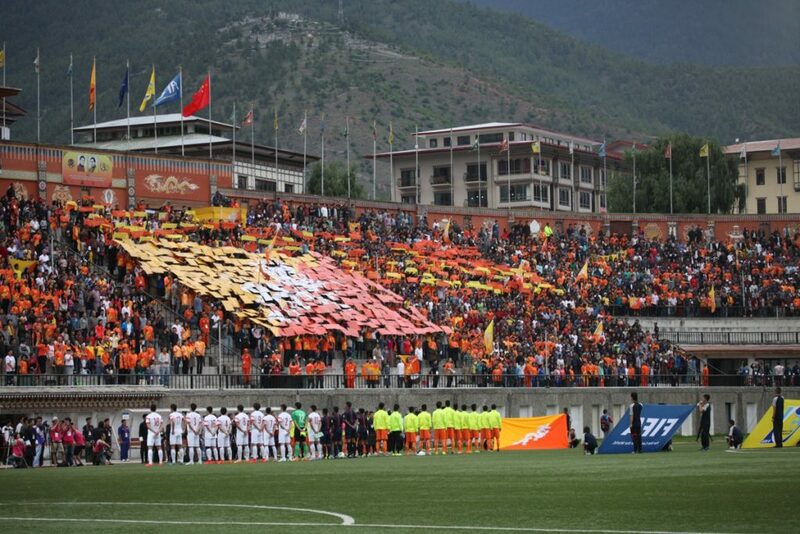 Five days later in the return leg, Bhutan’s superstar Chencho Gyeltshen scored a brace in a 2-1 victory in front of 20,000 delirious spectators packed into the Changlimithang Stadium, Thimphu, ensuring qualification into the second round. In truth, no one really knows just how many people saw the match, as after the gates were shut on an official sell out, many locked outside climbed to sit on walls, on rooftops, and up trees to see the match. For the second time in their history, Bhutan became worldwide news; reports of 20-0 defeats were forgotten in a flurry of articles detailing their first ever World Cup qualifier wins. Though celebrations wouldn’t last too long, as the second round began only a few months later. A journey into unchartered territory saw the minnows of Bhutan drawn against China, Qatar, Hong Kong, and The Maldives. Heavy defeats away to Qatar and China – 15-0 and 12-0 respectively helped to show the disparity between the haves and the have-nots in Asian football, but a 3-0 defeat at home to Qatar, along with narrow 1-0 defeats to Hong Kong, and a three-four reverse to The Maldives showed the players of Bhutan adapting to a higher level of competition. And despite the defeats, the supporters of the national team stayed right behind them, reaffirming that ‘philosophy’ of the country again; enjoy the game notwithstanding the scoreline. “Football in Bhutan has been drastically improving since the wins against Sri Lanka – and the National team are training so hard for the country every Monday and Friday, even though they aren’t having any matches. The Gross National Happiness has been improved and with a win they can make Bhutanese even happier”. Since the escapades of the World Cup, Chencho Gyeltshen, Bhutan’s star striker has played on loan at Surin City, Nonthaburi, and Satun United in Thailand, as well as scoring five goals in seven games for Chittagong Abahani in the Bangladesh Premier League. Slowly, the world is starting to recognise football in Bhutan. National team captain, Karun Gurung, encapsulates the humility and passion that the Bhutanese team have for the game they love, and the team they play for. ‘I have been playing in the national team for more than a decade and this team means a lot to me. We have worked hard, and harder to reach where we are now. We may not be on the level of the top teams, but yes we are growing’. “When we were pitted against the might of China, Qatar, Hong Kong and The Maldives, my message to the team for these games were different. I told them that most national teams have an identity. For example, when we talk of Brazil, it is their ginga football, the Germans are associated with the organisation, etc. It was time for the Bhutanese national team to carve out an identity of itself. I knew we weren’t going to win many games now that the opposition teams were much stronger and that there was a likelihood of getting embarrassed but no matter what the scoreline is, our team will never give up. However, with a 3-1 aggregate victory over Bangladesh in the play-off round of Asian Cup qualifying in October 2016, their story is truly only just beginning – national team of Bhutan have plenty more to look forward to in 2017. It is not satisfactory at all if one goes through the statistics of the Bhutan National team (played 87, won six, drawn seven, lost 74, 46 goals scored and 326 conceded) in the same light as you would relate with any other country. The geographical and financial obstacles that have been circumvented by this remarkable nation to even reach the international stage are unbelievable, let alone the victories achieved once there. But even more important than that is the unique perspective with which the Bhutanese see each and every game, win, lose, or draw. In a country that nurtures well-being like no other, every second of self-expression, of joy at playing and watching the game they love so much, is felt so keenly that simple victories or defeats are transcended by the very act of participation. It is the pure, joyous feeling that every young boy and girl that takes up a ball and dares to dream feels on whatever scrap of land they can find to call their own personal Nou Camp, Maracana, Wembley. 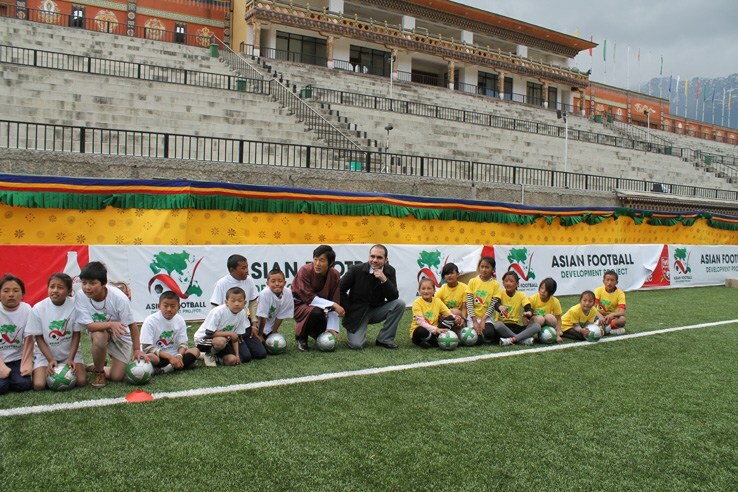 It is the true essence of what makes football so special – and in Bhutan, it is that that helps propel their national team toward the stars, regardless of the scoreline. It is a happiness we would all do well to try to find in our lives. And we should do; afterall football mirrors life. Badge of the Week: Aberystwyth Town F.C.